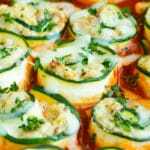 Treat yourself to these low-carb and keto zucchini lasagna roll-ups! They have all of the flavor of a traditional lasagna recipe without the unnecessary carbs. 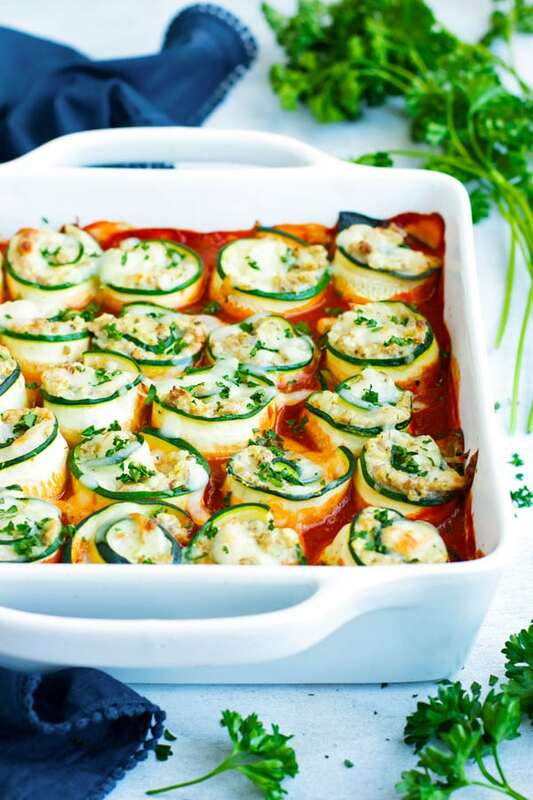 Plus, these zucchini lasagna rolls are naturally gluten-free, too! 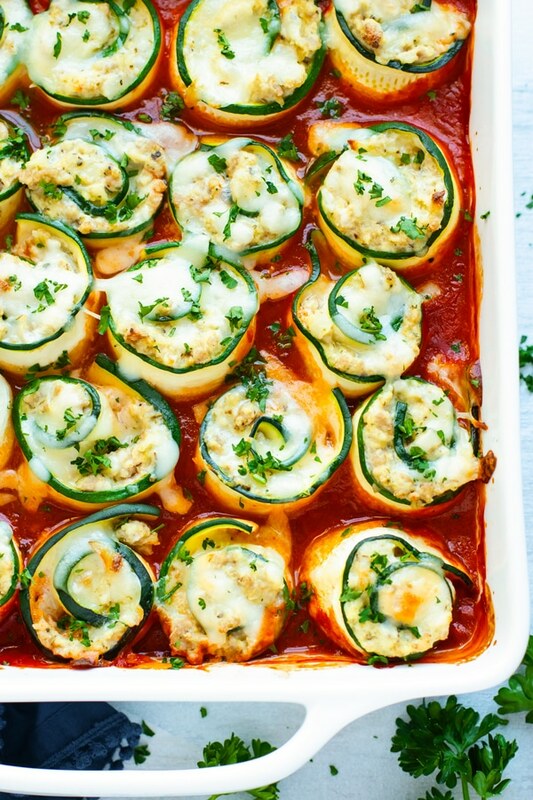 Why Hello There, Zucchini Lasagna Roll-Ups! Never have I ever had something so incredibly tasty that had so few carbs!! Growing up, I would always order the lasagna at Olive Garden. Little did I know, it wasn’t the pasta that carried all of the flavor… it was everything else. And these zucchini lasagna roll-ups totally prove that. While these tiny bites of zucchini lasagna bliss do take a little bit of love and effort, they are an absolute crowd-pleaser and look totally gorgeous. AmIright? 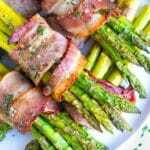 So put in a little bit of elbow grease before your next Keto ladies group gathering and you are sure to be deemed the best chef on the block. Now onto learning how to make zucchini lasagna roll-ups. How Do You Slice Your Zucchini for these Lasagna Rolls? 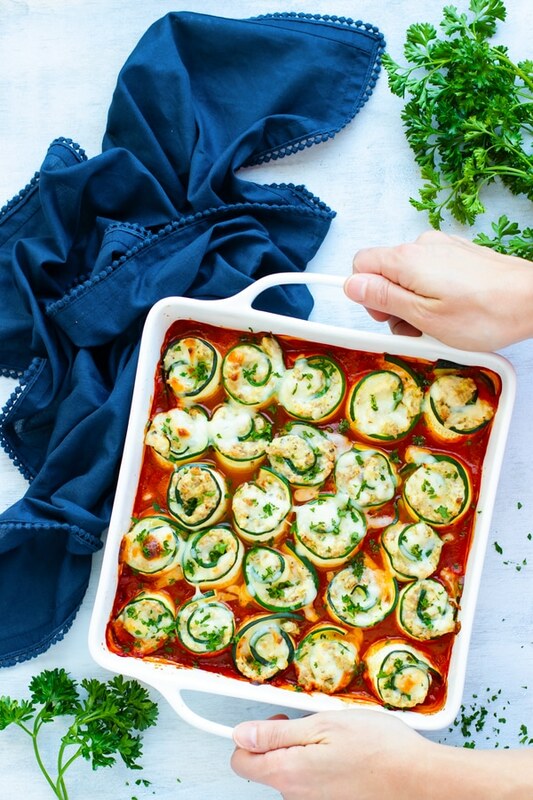 There is one HUGE determinant to how quickly you can whip up these zucchini lasagna roll-ups… and that is? I am sure many of you have one lying around in some cabinet collecting dust, so go ahead and pull it out and put it to work! A mandoline slices the zucchini in perfect 1/8″ slices so they will roll up with ease. If you do not have a mandoline, no worries! You can always slice your zucchini by hand, but please be very, very careful! One important thing I learned when creating this recipe was that zucchini loses moisture once cut. But there are ways around this. (Preferred method) Follow step one, but also refrigerate your zucchini roll-ups overnight AFTER rolling them up but BEFORE baking them and adding the marinara! After a few hours, they will have released a lot more moisture and you can simply drain the extra liquid before adding your marinara sauce and baking. These zucchini lasagna rolls are essentially a craft project… but with your food. Yes, I am giving you FULL permission to play with your food! Next, you will saute up your onion and ground turkey so it is cooked through. Mix together all of the yummy cheeses with your ground meat and load them into your zucchini slices. Get to rollin’ those zucchini roll-ups and then place them in a baking dish and bake away! How Can I Evolve these Zucchini Lasagna Roll-Ups? 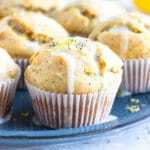 Use summer squash instead of zucchini. They have a super similar texture but will taste a tad bit sweeter. Bump up the spice by adding crushed red pepper flakes into the ground turkey mixture. Change up the marinara sauce by using an arrabbiata, or even a vodka sauce. 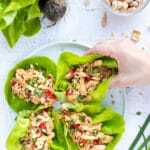 Treat yourself to these low-carb and keto zucchini lasagna roll-ups! 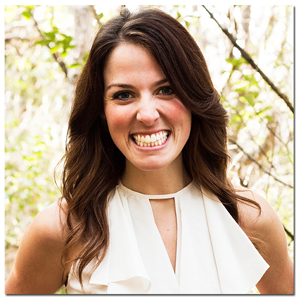 They have all of the flavor of a traditional lasagna recipe without the unnecessary carbs. 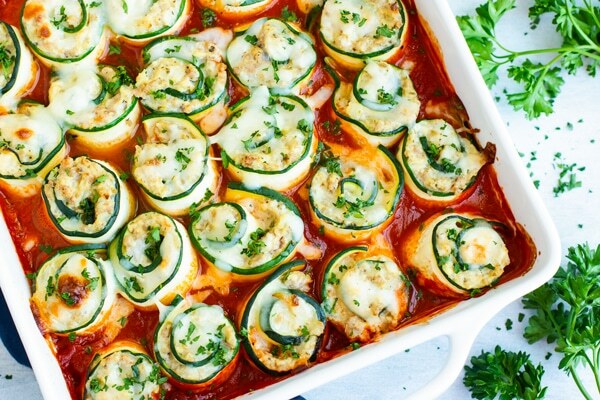 Plus, these zucchini lasagna rolls are naturally gluten-free lasagna recipe, too! Using a mandoline, cut zucchini lengthwise into 1/8 inch thick slices. (You can also use a knife, just be careful!) You should have about 24 slices. 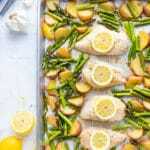 In a large skillet over medium heat combine oil, crushed garlic, and onion. Saute for 2-3 minutes. Add ground turkey and cook for an additional 6-8 minutes, or until completely cooked through. Pour 1 cup marinara sauce into the bottom of a 9-inch square baking dish. In a medium bowl combine 1 cup mozzarella, ricotta, Parmesan cheese, egg, Italian seasonings, salt and pepper. Mix until combined. Add ground turkey mixture and stir until combined. Place 1 ½ tablespoons of the turkey and cheese mixture along a zucchini slice. Roll zucchini slice up and place in a 9-inch square baking dish. Repeat with remaining cheese mixture and zucchini slices. 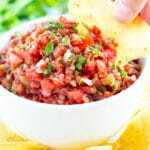 Pour remaining ½ cup marinara sauce over the roll-ups and top with 1 cup mozzarella cheese. 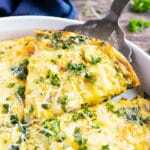 Serve with fresh parsley and enjoy! Serving size is 4 zucchini roll-ups. *Follow step #3, but also refrigerate your zucchini roll-ups overnight. Do this AFTER rolling them up but BEFORE baking them and adding the marinara. After a few hours, they will have released a lot more moisture and you can simply drain out the extra liquid before adding your marinara sauce and baking. 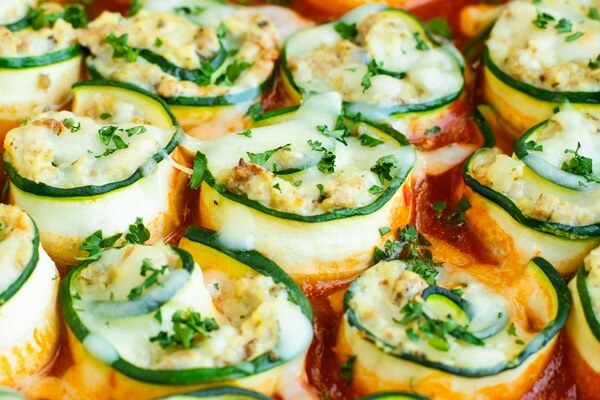 Want more recipes like these Zucchini Lasagna Roll-Ups? Hi! 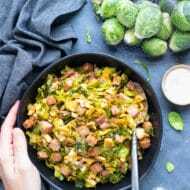 Love this recipe, and it came so delicious, but I had a little hesitation about the moment I had the add the meat and how. Seems like it has to be mixed with the cheese mixture at some point, right? Thank you! Everybody at home had a blast with the recipe, congratulations! So so happy you all had fun with it! Thanks so much for your comment, Angela! 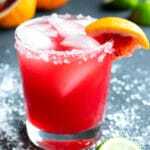 This recipe came out great! The whole family loved it. Thanks so much for sharing! So happy they enjoyed it, Rhonda!! 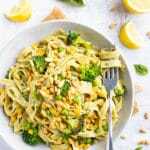 Who needs pasta with this amazing recipe?!? I used italian sausage but followed everything else including rolling and letting rest overnight. This received rave reviews in my home and the neighbor who gave me the giant zucchini! 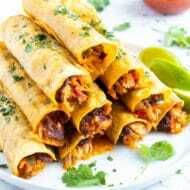 Would you cover the lasagna roll-ups when you put them overnight in the fridge? Hi Betty! Yes, I had mine lightly covered with aluminum foil. Thanks for the question! What would be considered a serving? Seems like a lot of calories for only one or two bites. Hi Monty! Depending on how many lasagna roll-ups you are able to make (I made about 24!) a serving size will be about 4 roll-ups. All of the cheese is pretty calorically dense! 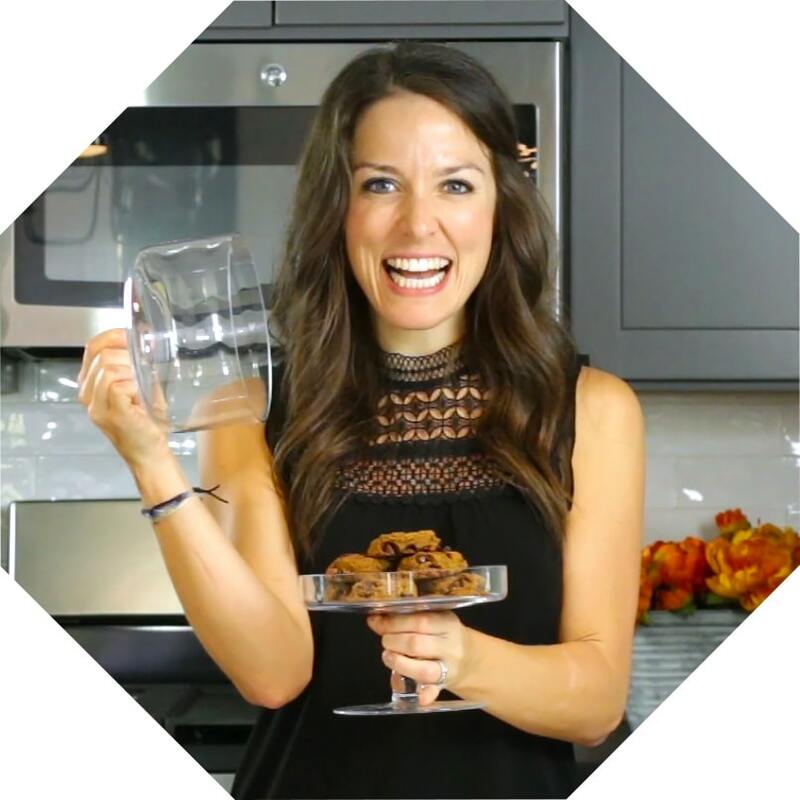 Hi, the recipe looks delicious! If I wanted to make this a vegetarian dish what do you suggest I substitute the meat with?